LEOcoinApp.com recently announced that it has launched a dedicated mobile application for LEOcoin users. LEOcoin Info, as the new application is titled, aims to update LEOcoin followers with minute-to-minute news updates, price alerts, and growing trends. In addition to the aforementioned features, LEOcoin Info lists all the seven public exchanges that exclusively allows LEOcoin trading for other crypto-, as well as fiat-currencies. The service appears to find itself parallel to LEOcoin’s core motto: To lobby legitimate digital currencies — including itself — in the global monetary system. Over the recent months, LEOcoin truly is one name that can be seen propagating the benefits of decentralised payment technologies in many global forums. The digital currency evidently took part in a recent summit in China, which saw its founders sharing dais with Danny Alexander, the Vice President of Asian Infrastructure Investment Bank. LEOcoins global presence has ensured that its community grows further, and create a parallel and advanced finance ecosystem for all. This can be further noticed in the rise of its market capitalisation, which since February 2016, has grown by 1000 p.c. LEOcoin right has touched the sixth largest cryptocurrency tag by market capitalisation (~$50 million). The LEOcoin price has increased from $0.067 in Feb 2016 to $0.60 at press time. The digital currency also impresses huge because of its PoS-only feature. It earlier used two different algorithms — Proof-of-Work and Proof-of-Stake. But in July, LEOcoin switched to PoS, considering that the said algorithm was more secure and environment friendly than PoW. LEOcoinApp.com added that for a young cryptocurrency app, LEOcoin Info is experiencing a great demand. The mobile application, which was launched for both iOS and Android smartphones and tablets, has been downloaded more than 1500 times in just 4 days. It also received an instant approval from Apple’s App Store, an app marketplace which is considered pretty stiff when it comes to accepting new applications. 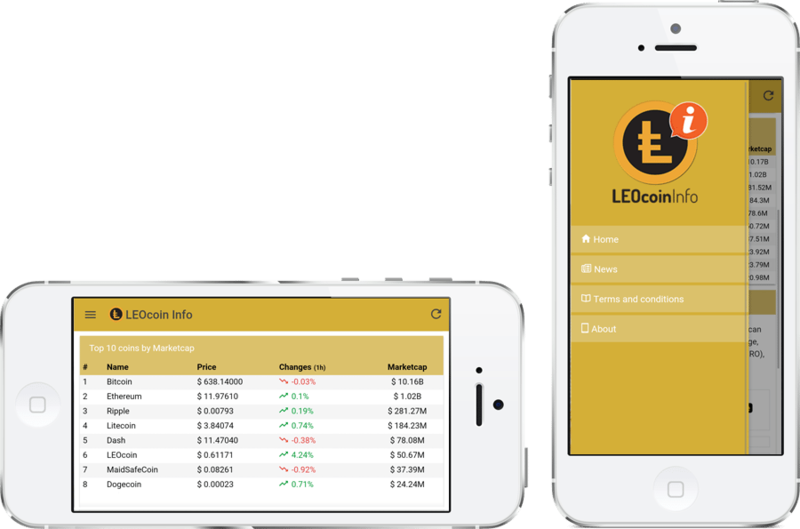 LEOcoin Info helps users learn more about the said digital currency through dedicated information widgets integrated within. Ideal for novices, these widgets can discuss many aspects of digital currencies in details. What’s further attractive about the mobile application is, its ability to put the idea of decentralisation before competition. LEOcoin info might carry the name of a registered digital currency, but also updates users with day-to-day price updates of many rivalry cryptocurrencies, including Bitcoin, Ethereum, Ripple, Dash and Litecoin.